Photograph by Cody O’Loughlin. Hair and makeup by Laura Dillon. What inspired you to pursue a career in interior design? I was born and raised in Japan, and spent summers and holidays in Denmark. My mom is Japanese, and my dad is Danish. Design is very integral to those cultures, so I feel like I grew up with it. Also, my mom worked for Royal Copenhagen and Georg Jensen, in Copenhagen, and did all the displays for the stores. So I watched her do that kind of stuff, and I was always interested in interior design. I moved to Boston for school and picked Suffolk because I knew they had a really good interior design program. I didn’t know that it would take over my life, but it did. You recently completed a massive interior design project at the Lucas. How would you describe the building? 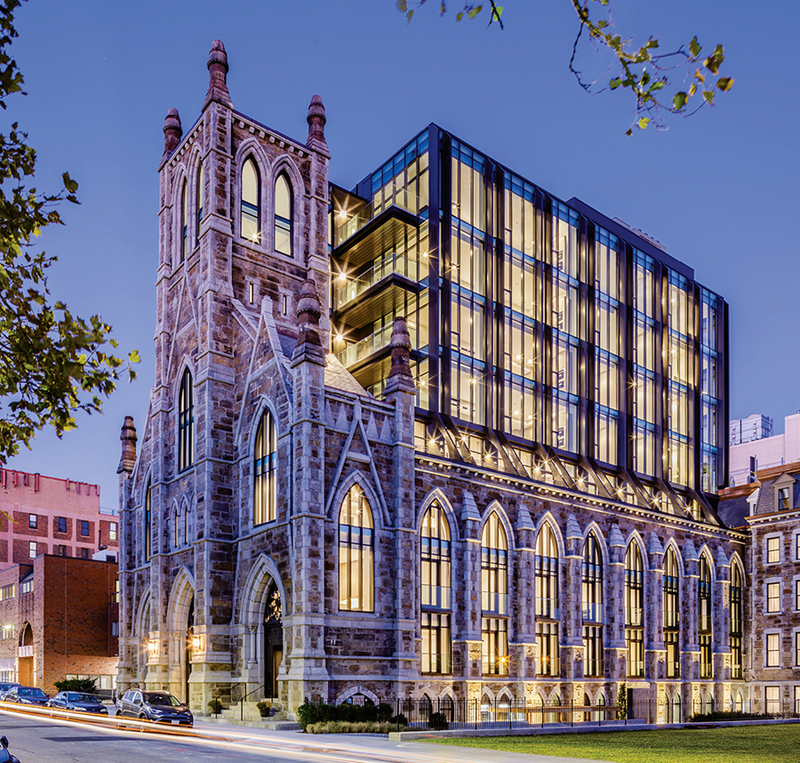 The Lucas is a late-19th-century church that was converted into luxury condos. It’s a boutique 33-unit building with a new steel-and-glass tower. It’s unique, in that the units on the lower level are in the original church structure and the upper units are in the tower. A good friend of mine, Ricardo Rodriguez, was the real estate agent for the building and introduced me to the developer, New Boston Ventures. I’m very appreciative to them because they totally took a chance. I’d worked at Elkus Manfredi for five years before, so I felt capable, but I also got really lucky with this opportunity. The Lucas is so different and such a monumental building in the neighborhood that I definitely wanted to be part of it. It’s very rewarding and special to be part of the Boston skyline now. That’s a very cool thing. What was the scope of your work there? I did all the interior finishes and worked with the architect, Finegold Alexander Architects, on the layouts. It was a group effort: The client was super hands-on, and Ricardo was, too. The challenge was maintaining some of the church elements without making it feel like living in a church. The rosette windows, for example, were one of very few things we kept from the original building. How would you describe your overall design approach? I wanted to bring a very modern aesthetic to the interior. There are open living rooms in the units, for example, so we tried to make the kitchen disappear by keeping the colors neutral. Everything blends together. We also had the cabinets go all the way to the ceiling so the kitchen would have ample storage but still feel like it was a natural part of the space. That’s why we didn’t use hardware on the cabinet doors. And then I designed the lobby and the corridors to feel cozier. I wanted the units themselves to feel light and bright, so there’d be that contrast between the public spaces and units. It’s important to think about the building itself when you’re designing. I think a lot of design elements get driven by the structure. I like having a story behind each thing. We’re not just picking random stuff—there’s a reason behind it. The Lucas’s developers really care about the design details, which is nice to see. I think that’s why we were able to make such a cool building. Is there a difference in the way you approach a project like this versus a project for a single client? Absolutely. You have to make sure a project like this resonates with multiple people instead of a specific family. It’s more about functionality. Of course, aesthetic is important, and everything was extremely thought-out, but I think you also need to give the homeowners—the end clients—an opportunity to make the space their own. You almost want to give them a blank canvas that they can change. Some people criticized the plans for the Lucas when they were first announced in 2015. What made you want to be involved? Everyone has their point of view. I think controversy is a good thing. Look at my company name. This church wasn’t in use for years, so it’s cool that now it’s condos. The developers could have torn it down and put up a whole new building, but they kept the structure. They kept that part of Boston’s history and just changed it to fit into our time now. Boston’s skyline can get sort of mundane and repetitive, and the fact that the Lucas has personality makes me happy and interests me. I think it’s good to be different. Where would you like to see design in Boston go from here? There are a lot of different people coming to Boston with all the new companies moving here. The city is becoming more diverse, so interior design is evolving with that. I would love to see people think more about functional design. With all these high rises going up, apartment footprints are getting smaller and smaller. We need to be smarter about how we use our space. I would love for people to think about design in that way. It’s not just about colors and throw pillows and finishes. I hope people understand that.